Dan Kelly never takes my photos seriously. 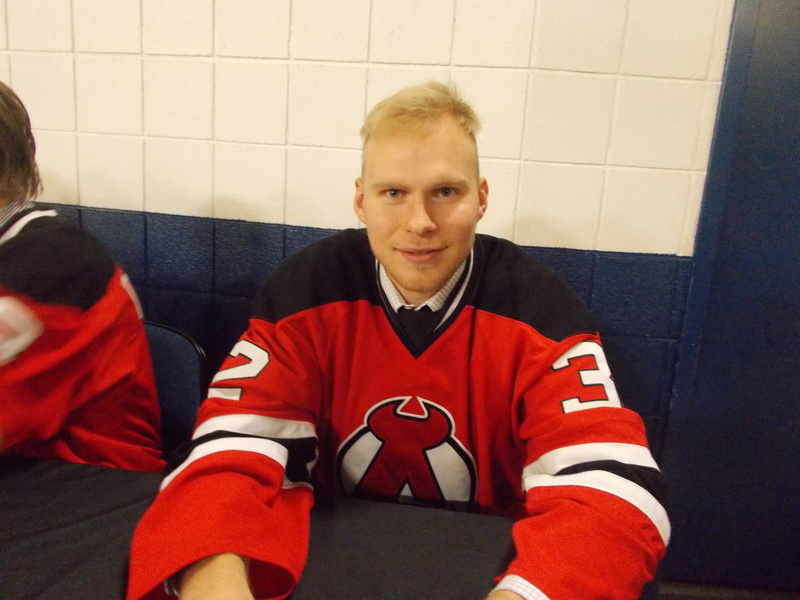 The four game road trip came to an end Friday night in Binghamton, the Devils third and final visit to the Southern Tier of the season. Things started out extremely well, when just 1:09 in Stefan Matteau scored his 7th for a 1-0 lead. Matt Puempel would tie it up with a power play goal late in the first. Second period was virtually all B-Sens, starting with a Derek Grant breakaway shorthanded goal 1:25 in to put Binghamton ahead 2-1. Corey Cowick and Shane Prince would score nearly 2 minutes apart later to pad the lead to 4-1. Then a rare 10 minute misconduct penalty to Keith Kinkaid after he batted a puck over the glass out of sheer frustration would add insult. Grant would score his second of the night 1:26 into the third to make it a 5-1 game. Scott Timmins would score late to cut the lead to 5-2, but that was all. Kinkaid stopped 35 of 40 in taking the loss (I was actually surprised he wasn’t pulled at any point in the game, to be honest). 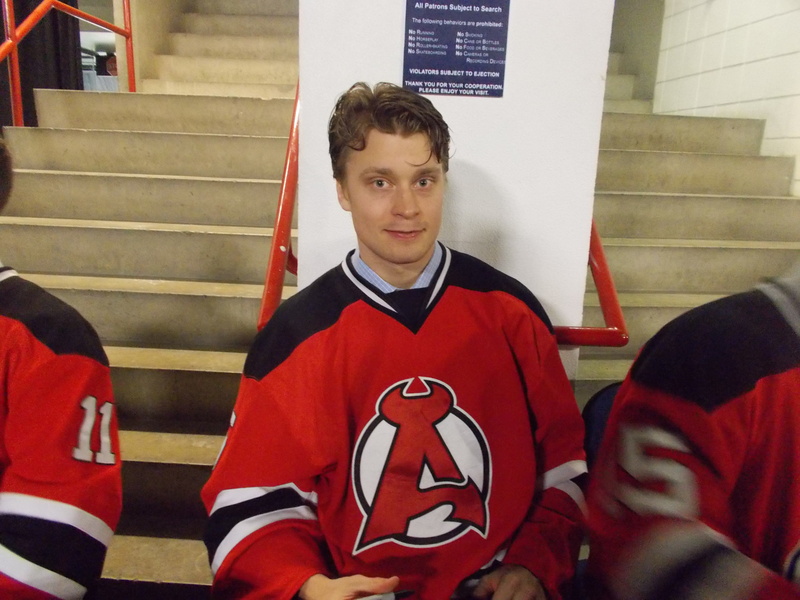 Reid Boucher had an assist in his first game back after returning from New Jersey, while Seth Helgeson and Corbin McPherson were the only Devils to not have a negative plus/minus (McPherson actually finished a +2). 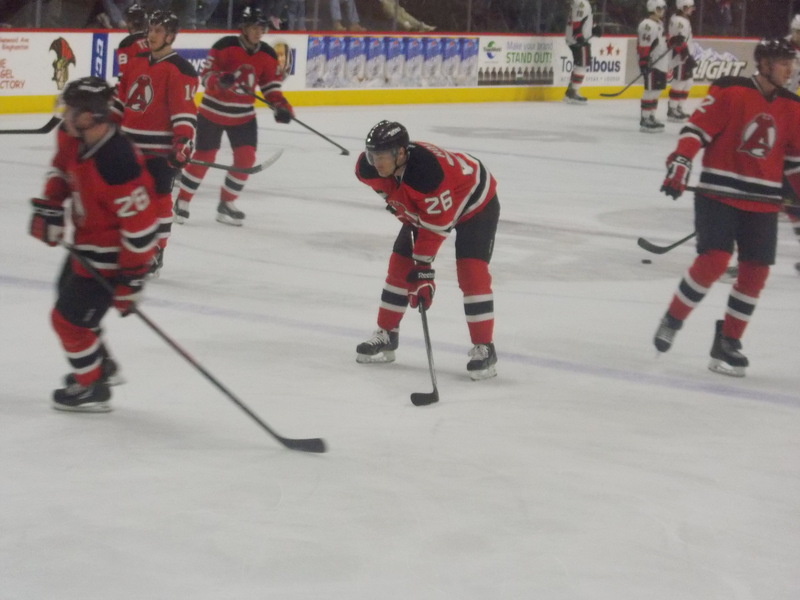 It was back on real home ice for the first time in two weeks on Saturday afternoon, as Albany began a three game homestand by hosting the Phantoms, game #9 of the Time Warner Cable Cup series. In a surprise move, Joe Whitney was back in the lineup, fresh off playing 8 minutes the night before in New Jersey in his NHL debut. 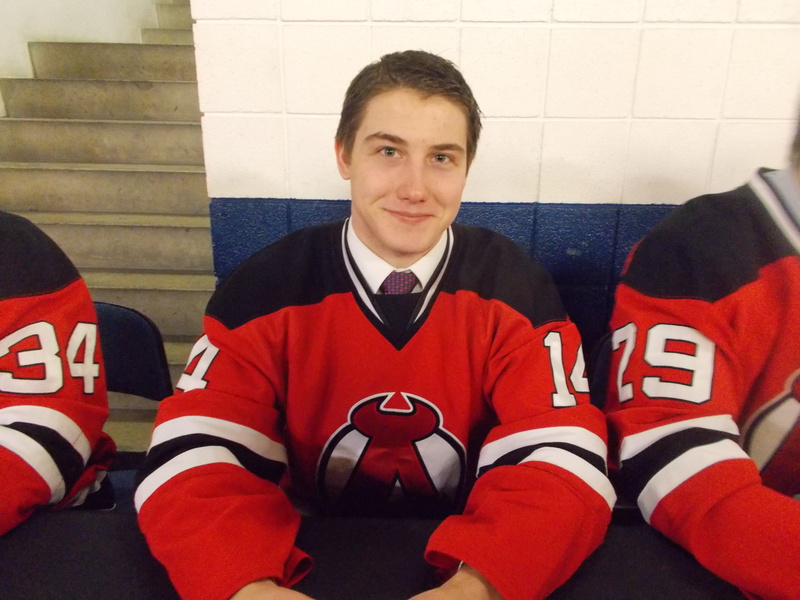 Like the night before, the Devils got off on the right foot, er, skate, as Mike Sislo scored on a power play with 52 seconds remaining in the first for a 1-0 lead. Tye McGinn would tie the game late in the second. Third period both teams had trouble getting the go ahead goal on either Cal Heeter or Scott Wedgewood, who was having an outstanding day in net. Then with just 20 seconds left in regulation, what should have been an interference call resulted in a game winning goal for Adirondack off the stick of Jason Akeson (at the time, Brandon Manning was awarded the goal). 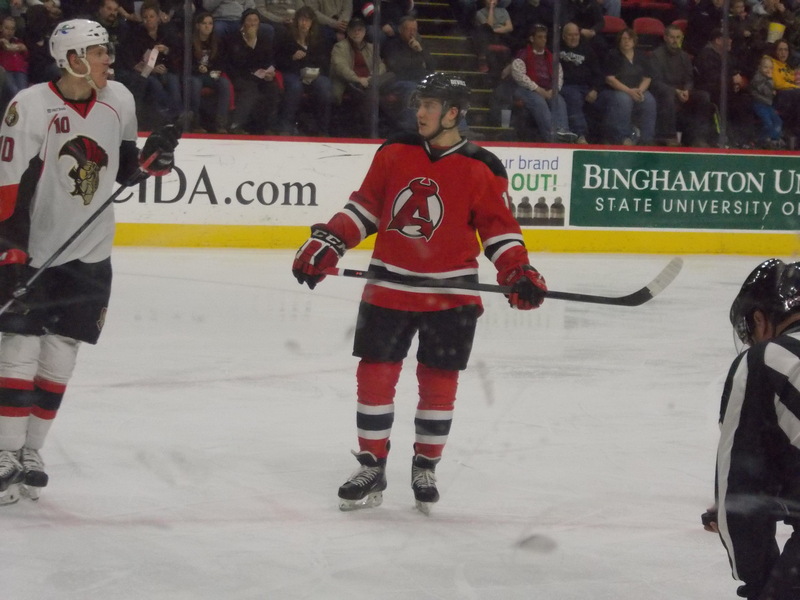 The Devils tried to draw up a plan to retie it, but it wasn’t meant to be, and Albany’s second straight regulation loss was a heartbreaker. Wedgewood stopped 20 of 22 shots in a hard luck defeat. 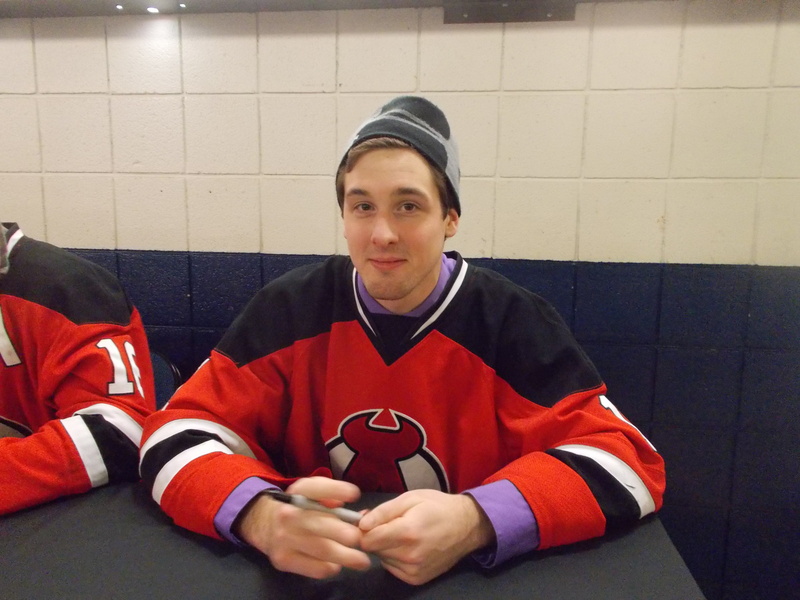 Reid Boucher notched an assist for the second straight game. 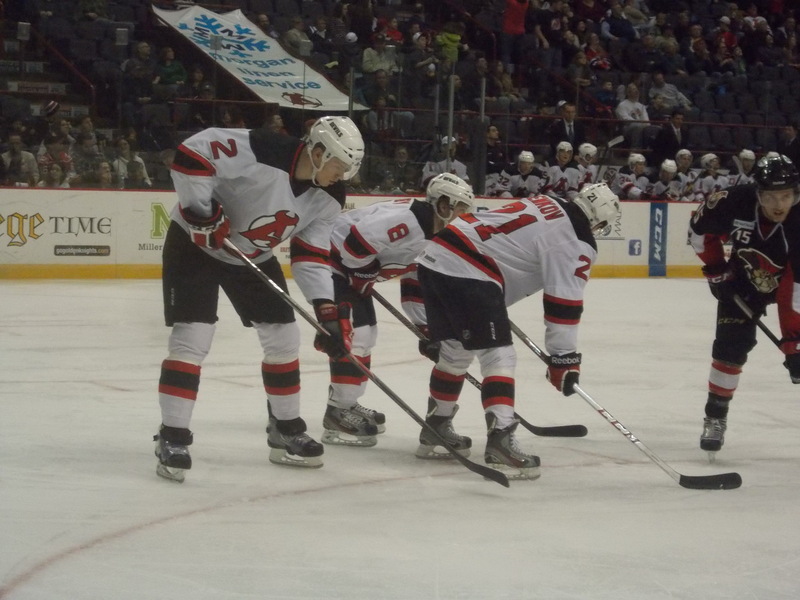 To finish out the weekend, the Devils played host to Binghamton to finish out a sort of home and home series. 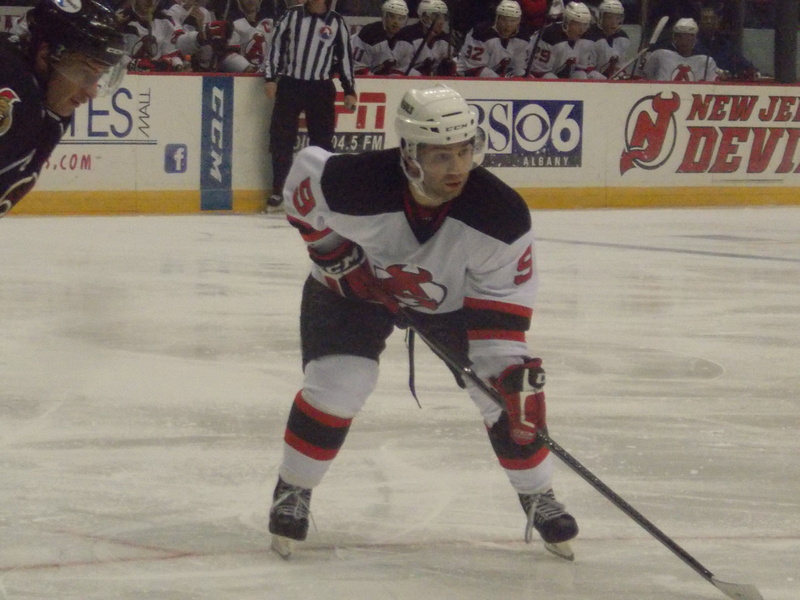 First period was owned by one player: Binghamton’s Shane Prince. He would score twice on the Senators’ first two shots of the game 2 and a half minutes apart in the first. Mike Hoeffel would cut the deficit in half 30 seconds later with his seventh. But on the third Senators shot of the game Prince would complete the natural hat trick for a 3-1 lead, chasing starter Keith Kinkaid from the net in favor of Scott Wedgewood. If you’re keeping track, that’s 3 goals on 3 shots from one player in 9:21 that Kinkaid gave up. Ouch. Wedgewood would have an easier time in the period, only having to make one save in the remaining 10 minutes. 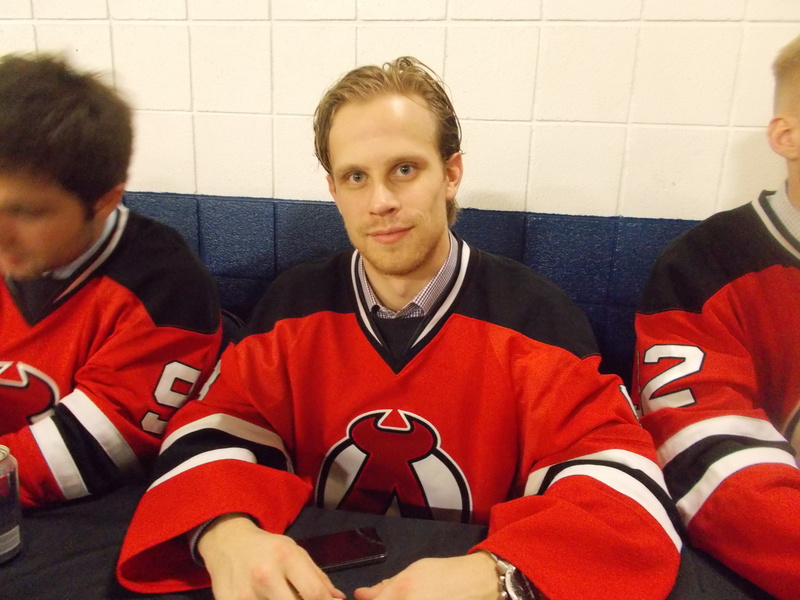 Adam Larsson would score on a power play to bring the Devils to within 3-2. Dan Kelly would tie the game at 3 with his second of the season 5 minutes into the second period. Matt Puempel would break the tie with a 5 on 3 power play goal less than 5 minutes later. Third period Binghamton would add to their lead on a Jim O’Brien goal, then Puempel would put the cherry on the top with his second of the game into an empty net at the end. 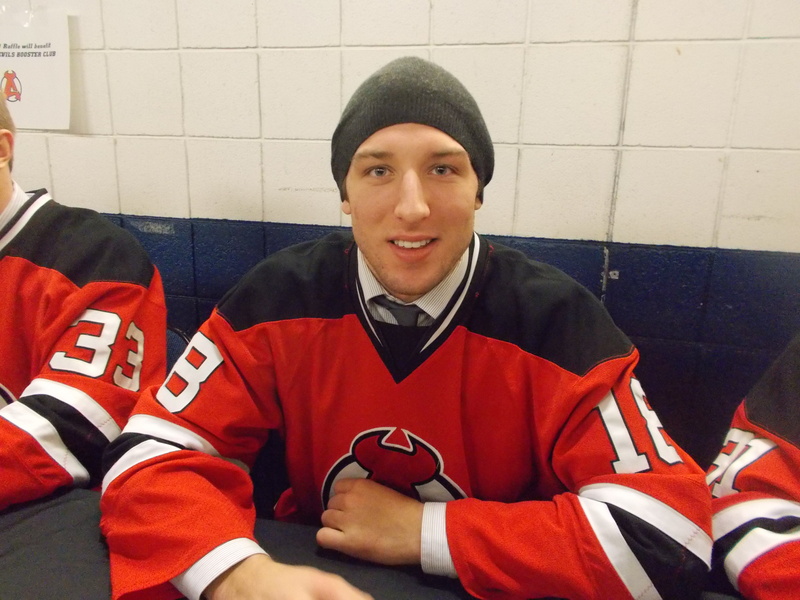 All that despite the Devils outshooting the Senators by a huge 36-19 margin…the first period killed them on this day. Wedgewood stopped 13 of 15 in relief and got stuck with the loss. Reece Scarlett contributed 2 assists in his first appearance of the weekend. Well…when it’s a weekend where no one really stood out, it’s a hard decision. 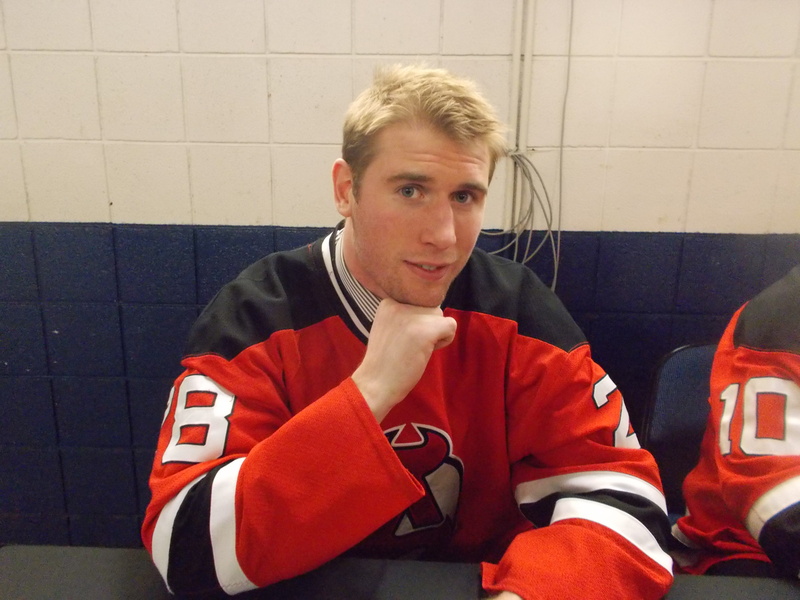 But I think I’ll give the nod to Scott Wedgewood, who deserved a better fate in his two appearances this weekend. The Jackals had a 3 in 3 weekend of their own, hosting Fort Wayne in a 3 game series. They dropped the first two games 4-3 and 4-0 (an hour delay to start due to ice issues didn’t help), then salvaged the final game with a 4-1 win. Harry Young was quite busy over the weekend, notching an assist and racking up 19 penalty minutes. 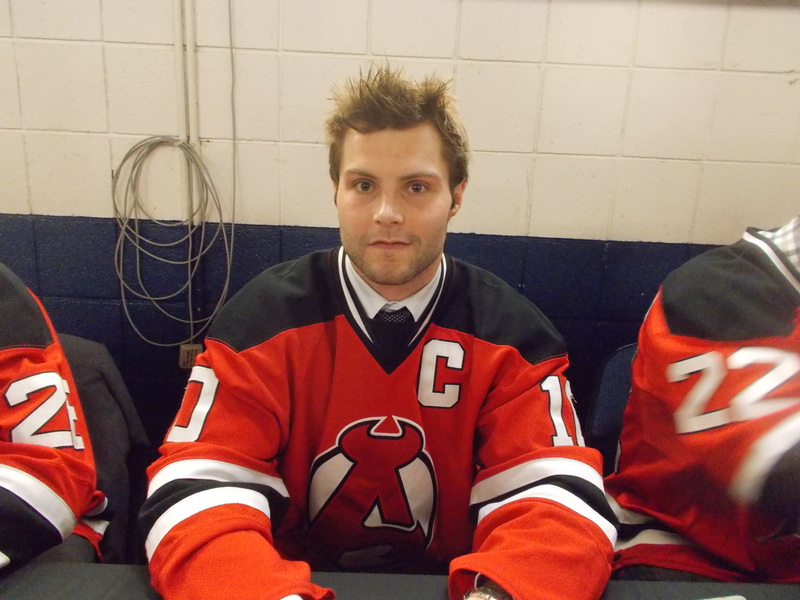 The same with Riley Boychuk, who also added an assist and 12 penalty minutes. 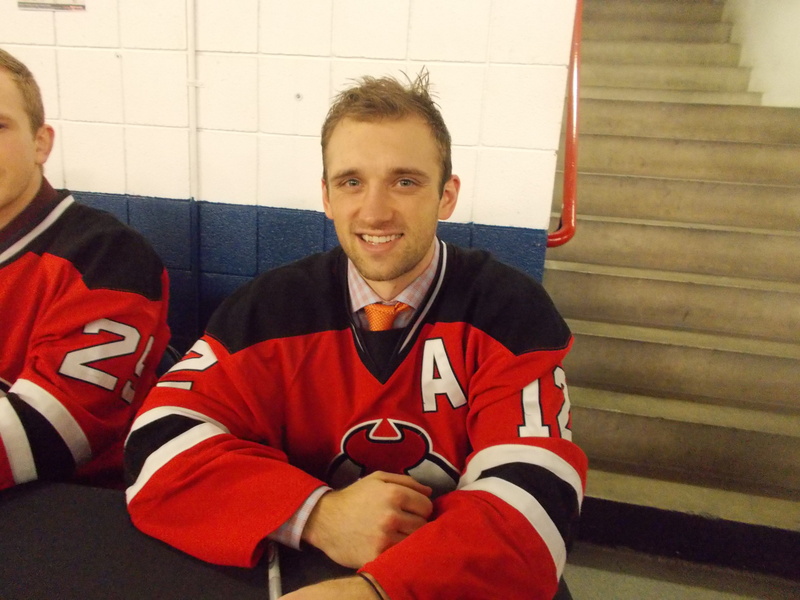 Maxime Clermont is currently on 21 day injured reserve. 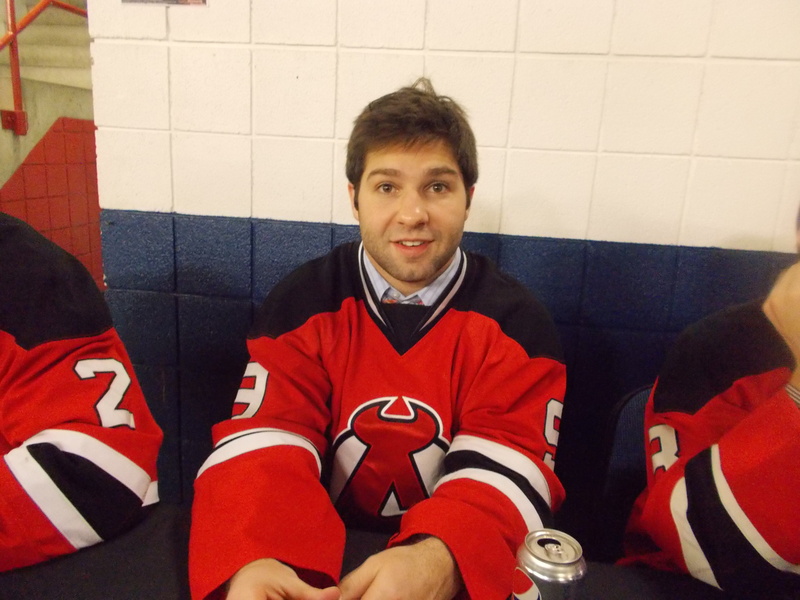 -While the Devils were in Binghamton on Friday night, Joe Whitney was at The Rock making his NHL debut (and Devils Twitter were coming up with #JoeWhitneyFacts…seriously go click on it it’s hilarious). 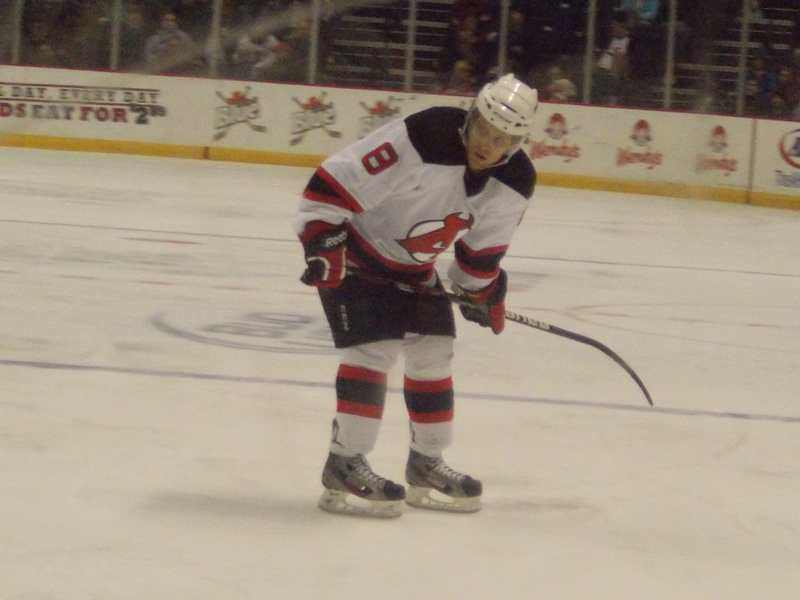 Saturday afternoon he was back at the Times Union Center and in the lineup. 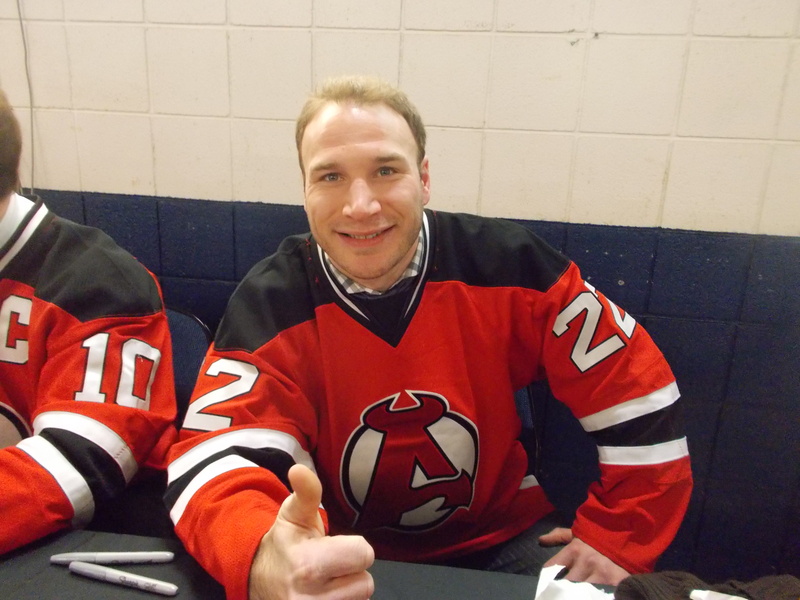 And he was even reunited with his original line to start the season, Scott Timmins and Reid Boucher. 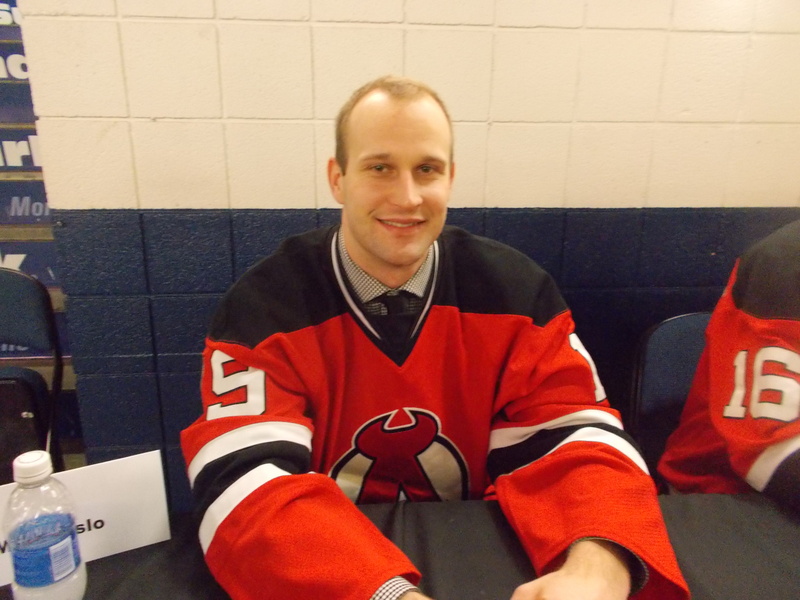 -The injury front…just Darcy Zajac…remains status quo. Just two games coming up, both against divisional foes. 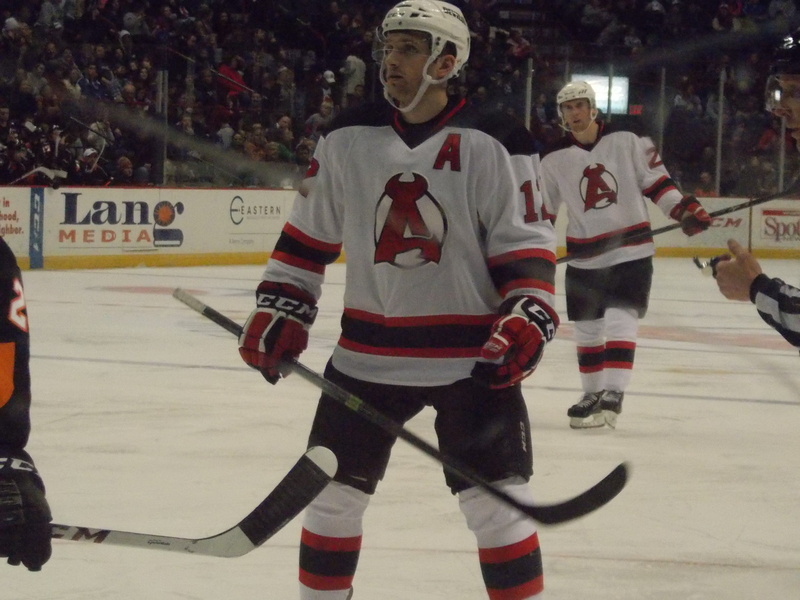 Friday night Albany wraps up their homestand and the month of January when they host Bridgeport. Then on Saturday it’s off to Hartford to take on the Wolfpack. Where: Broome County Veterans Memorial Arena, Binghamton, NY.